Rose hips should be given as part of a natural diet. It has an enormous Vitamin C level as well as a vast array of other vitamins and a high mineral count; including vitamins C, A, B1, B2, B3 and K, bioflavonoids (including rutin), carotenoids, tannins, calcium, magnesium, silica, phosphorus and copper. As well as being considered a dietary supplement, rose hips are often fed to horses recuperating from illness or injury, as they help to restore the immune system and aid tissue repair. Feeding them as part of the daily diet is beneficial for preventing illness. 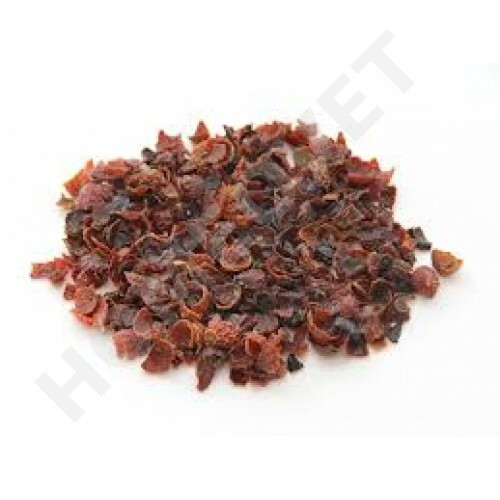 The vitamin C in rose hips acts as a natural antihistamine, which can asist the allergy-prone horse. Bioflavonoids, as well has having potent antioxidant and antiinflammatory activity, enchance Vitamin C's ability to strengthen blood vessel walls, and this effect contributes to rosehip's reputation for encouraging healthy hoof growth.They also contain biotin for optimum hoof health. Rose hips can also help alleviate gastric inflammation and diarrhoea.